One of the most delightful events in the Monlam is the Kangyur procession around the Bodhi Tree during the freshness of early morning in the palest shade of tinted light. For the first time this year the Karmapa invited all the nuns to attend the procession and they could be seen walking through the fields from the Pavilion to the Bodhi Tree just after dawn – a momentary capture of a new Buddhism emerging from its ancient roots. While the monks were assigned the reading of the Kangyur in the Monlam Pavilion, the Gelongs and Gelongmas gathered at the Mahabodhi Temple where 110 volumes of the new Jiang Kangyur were stacked in a corner near the Bodhi Tree:109 volumes of text and an extra volume containing a scroll preface written by the King of Jiang. The new edition of the Jiang Kangyur, unveiled at the 16th Karmapa Commemoration day, was a remarkable production, made in Taiwan under the 17th Karmapa’s scrupulous supervision. 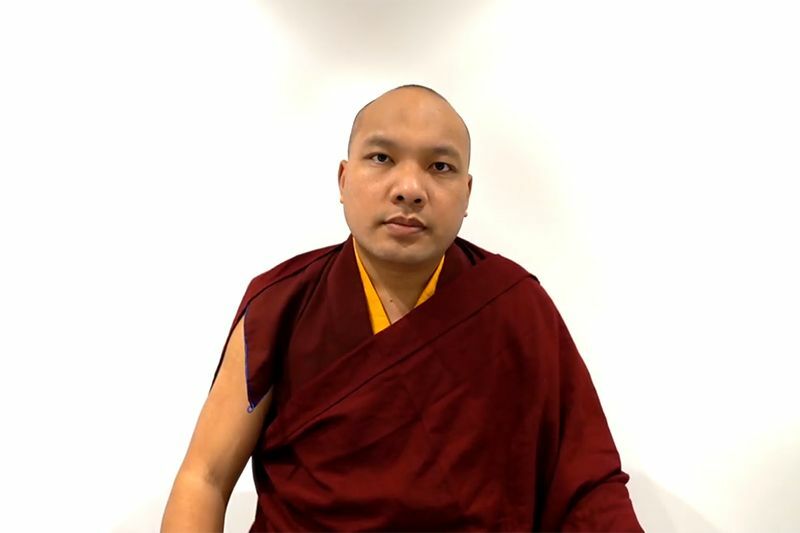 ”It is an important and precious edition that will help to revive teachings in danger of being lost”, the Karmapa announced before the unveiling. To print these books, the Karmapa commented later at the Kangyur rehearsal, is more expensive but more meaningful than to build a monastery. An empty monastery cannot be a place of learning. People can go there but they cannot learn anything. If we print books, then people can always learn from them. 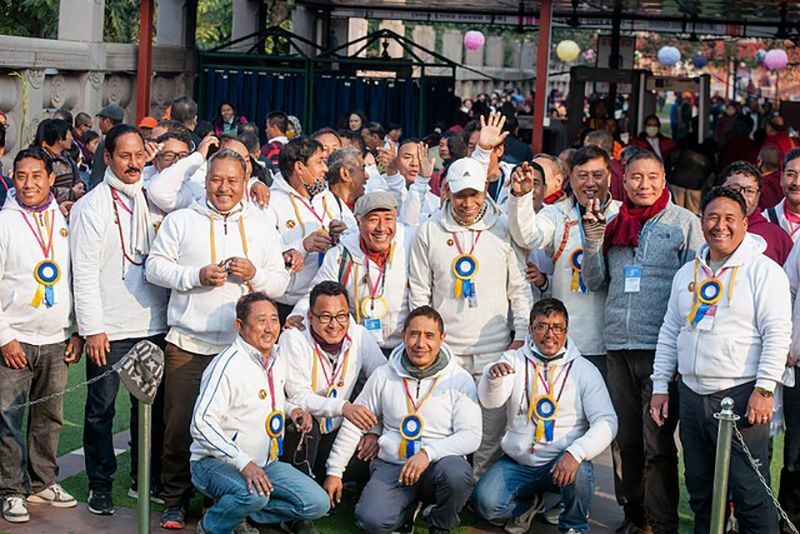 Although the first edition of the Jiang Kangyur was printed 600 years ago, only on February 20, 2016 did it finally arrive at the Mahabodhi Stupa in Bodhgaya. And so began a very special occasion. The red carpet was laid out on the steps leading to the inner sanctum of the Mahabodhi Temple in preparation and at 7:30 the music of gyalings and two whorled conch shells announced the Karmapa’s arrival. He descended the steps to the Mahabodhi inner kora in procession with his heart sons, HE Jamgon Kongtrul Rinpoche and HE Goshir Gyaltsap Rinpoche, followed by Mingyur Rinpoche, Ringu Tulku and the entourage of tulkus, khenpos, followed by the gelongs and gelongmas, who carried the sacred texts. Each volume was wrapped in an outer layer of fire, water, and bug resistant soft-gold Chinese silk brocade; inside the wrapping was a blue brocade box in a muted floral design and inside that was a gold brocade hard cover enclosing 300 pages of text written in red ink. Each page measured 70×20 cm and one volume weighed in at about 9 kg. 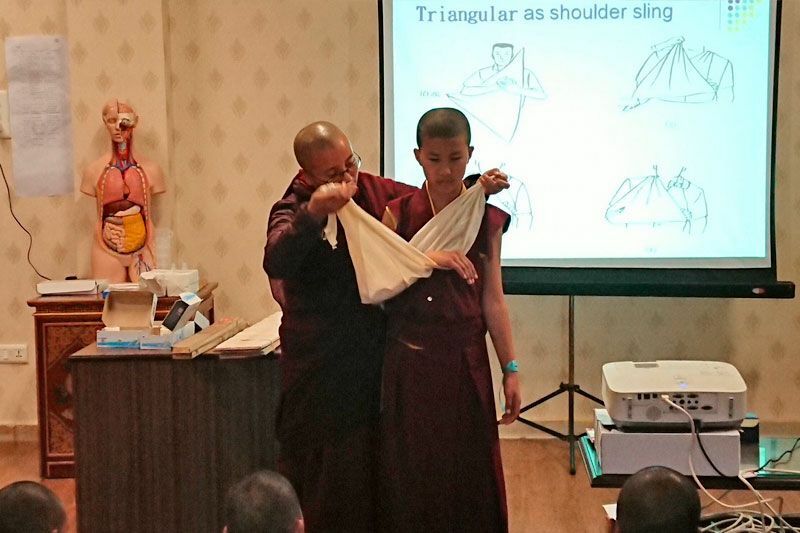 During rehearsals the older monks faltered under the weight when placing the Kangyur on the left shoulder, even with the support of the right hand. Another way to carry the text was immediately improvised by strapping it onto the back in order to distribute the weight more evenly. Seeing that the texts were still too heavy for the 13 Gelongmas to carry on their backs, the Karmapa arranged for them to each carry a copy of the 16th Karmapa’s newly published collected works. 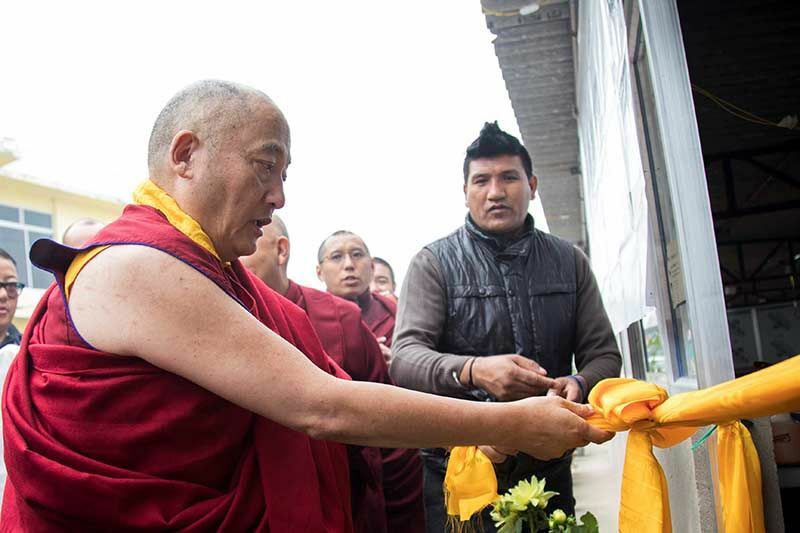 As is customary, lay followers had gathered to watch the sacred procession with reverence, scattering petals on the path, holding offering scarves and incense as the monks walked past in a slow meditative pace, eyes downwards, reciting mantras. 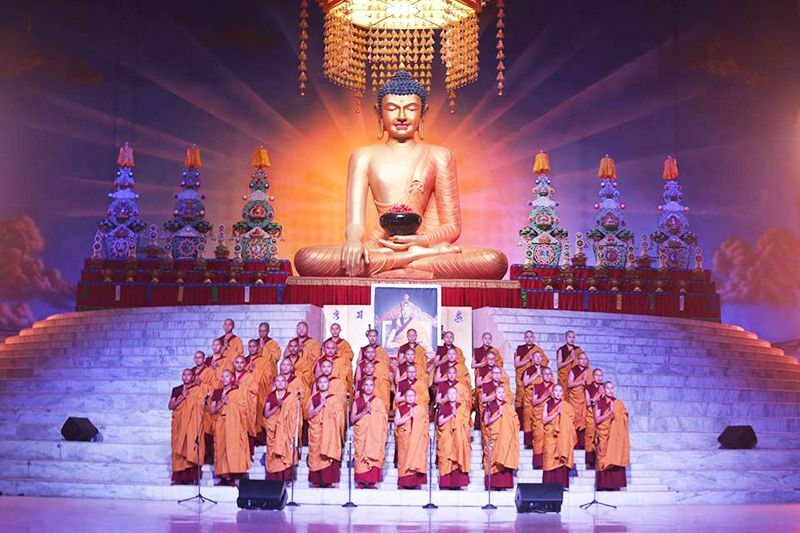 This year, however, religious fervour overtook the crowd as the Karmapa neared the entrance of the inner sanctum sheltering the great golden Buddha, the most revered image in the Buddhist world. It was reminiscent of the fervour seen in Tibet where it is viewed as an expression of longing for the guru. When the Karmapa came out of the shrine, having made his offerings, the crowd surged towards him. He walked the inner kora unperturbed, eyes downwards, towards the sacred Bo Tree, in a calm procession with his monastic entourage. He made prayers and then walked slowly, up the stairs to start the outer kora. The crowds ran in hot pursuit gripped by one thought: to see the Karmapa’s face, which is said to be an important attribute of his Buddha activity. At each corner of the kora hundreds of the devotees waited eagerly for him. As the Karmapa’s face became visible to the crowd, their frenzy calmed, their grasping abated and there was, in its stead, the presence of peace. Like the Buddha stopping the mad elephant in its tracks with a single gesture, the crowd quieted, just by seeing him and experiencing his powerful aura. Behold the Buddha! It was Tongdrol: liberation through seeing.